The 1936 Annual Meeting was a most harmonious session. Twenty-three of thirty-six members were represented. The interest of the member clubs in CFA matters is apparent from the sheaf of letters from members which are in the minute book. These letters express the opinion of clubs on matters to be discussed at the meeting, and are from Empire, California Cat Club, El Paso Cat Council, Virginia Cat Society, Chicago Persian Society, Boston Cat Club, and Jackson Persian Society. The Cat Gazette was apparently being satisfactorily supported, and the CFA registrations were being publicized in the Gazette rather than in periodic Stud Books. At the 1937 Annual Meeting, two sets of credentials had been sent to the Secretary by the Columbian Cat Fanciers of Washington, D.C. This club had split, and two sets of delegates had been named, each purporting to represent the club. The use of a Credentials Committee to recommend to the Annual Meeting which of the conflicting sets of delegates should be seated was avoided when Mr. and Mrs. Ira C. Koehne, representing one faction, did not appear. However, CFA had not heard the last of Mr. Koehne. During the year, Mr. Zieses resigned from the board and Miss Hantzmon was elected to the vacancy. Also during this year, Mr. Koehne filed a suit against CFA, its secretary, its recorder, and the Columbia Cat Fanciers, in the United States District Court for the District of Columbia. The suit involved a rambling set of charges, which, in the opinion of CFA counsel, did not add up to any cause of action. During the year, counsel successfully moved four times to have the suit dismissed. On the first three occasions, Mr. Koehne was given an opportunity to amend his papers so as to state a cause of action. The fourth time, the Court, at the request of CFA counsel, dismissed the suit with prejudice, thus preventing the filing of a fourth amended pleading. The records of CFA do not disclose any other occasion when CFA was involved in litigation in the Courts. At the 1938 Annual Meeting, Mrs. Stewart was elected vice-president, and Miss Goodwin was elected to succeed Mrs. Stewart on the Board of Directors. At this meeting, the officers were reelected; Miss Hydon, president; Mrs. Stewart, vice-president; and Miss Hantzmon, secretary-treasurer. Miss Hydon, Miss Goodwin, Miss Glenz, Mrs. Warfel, Mrs. Morfit and Mrs. Goodeve were reelected to the Board, and Mrs. Karl Norton was elected to the Board in place of Miss Hantzmon. 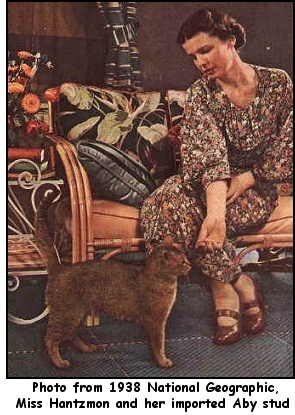 During 1939, Mrs. Hildebrand sold the Cat Gazette to All Pets, and CFA then again began publishing Stud Books. The 1940 Annual Meeting was harmonious, and all officers and Board members were reelected. Difficulty with the handling of “protests” regarding shows was indicated in a special meeting of members held on August 7, 1940 at which time the provisions still in the Constitution which permit the Board to consider charges without a formal protest, were added by amendment. Before the next board meeting, Mrs. Goodeve died, and the succeeding board meeting adopted resolutions of sympathy, and expressions of the great loss which the death of this lady caused to CFA. Mrs. John S. Hunter was elected to the board to fill the vacancy. Prior to the 1941 Annual Meeting, Mrs. R. W. Grosset was elected to the board to replace Mrs. Warfel. The 1941 Annual Meeting was not so peaceful, although the minutes of the meeting do not dwell on any matter of moment. As had occurred before, litter registration was discussed, but little interest was indicated. All officers and board members were reelected, except that Mrs. Owen Gunderson was elected secretary-treasurer to replace Miss Hantzmon. At the April 1941 board meeting, the resignation of Columbian Cat Fanciers was accepted. Mrs. Metcalf had resigned as recorder, and refused to reconsider her resignation. Mrs. James R. Mood was then appointed recorder. Mrs. Gunderson resigned as secretary-treasurer at the November 1941 board meeting, and Miss Goodwin was elected to succeed her. At this meeting also, Mrs. C. F. Rotter was added to the approval pending list of judges. The shadow of war clouded the 1942 Annual Meeting. It was one of the shorter Annual Meetings, lasting less than one hour. Miss Goodwin asked that she not be reelected to the board, and she nominated Mrs. Warfel Smith (formerly Mrs. Mary B. Warfel) in her stead. With this change, all other officers and directors were reelected. The May 6, 1942 board meeting reported a letter from the Honolulu Cat Club asking that its show license “not used this year be allowed to lie dormant until such time as the club finds it advisable to hold its next show”. The manufacturer of championship medals and bars reported that a copper base could no longer be used for these items, and that due to restrictions, a much more expensive sterling silver base would be required. The board granted the request of the Honolulu club, and passed on to the member clubs the information as to the medals and bars. The November 1942 board meeting was cancelled. Members were advised by letter from the secretary that many planned shows were being cancelled. Thus, CFA prepared to carry through the war years which were ahead.